ABOARD THE PAPAL AIRCRAFT — Pope Francis reached out to gays on Monday, saying he wouldn’t judge priests for their sexual orientation in a remarkably open and wide-ranging news conference as he returned from his first foreign trip. “If someone is gay and he searches for the Lord and has good will, who am I to judge?” Francis asked. Well you are The Pope, dear. It’s right there in the job description. The notion of an All-Seeing, All-Knowing Deity who has the capacity to “forget” what he sees and knows will doubtless keep both atheists and theologians busy for some time. — He said he was thinking of traveling to the Holy Land next year and is considering invitations from Sri Lanka and the Philippines as well. — The planned Dec. 8 canonizations of Popes John Paul II and John XXIII will likely be postponed — perhaps until the weekend after Easter — because road conditions in December would be dangerously icy for Poles traveling to the ceremony by bus. — And he solved the mystery that has been circulating ever since he was pictured boarding the plane to Rio carrying his own black bag, an unusual break from Vatican protocol. “The keys to the atomic bomb weren’t in it,” Francis quipped. Rather, he said, the bag merely contained a razor, his breviary prayer book, his agenda and a book on St. Terese of Lisieux, to whom he is particularly devoted. “It’s normal” to carry a bag when traveling, he said. 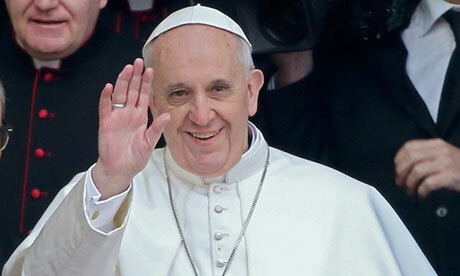 “We have to get use to this being normal, this normalcy of life,” for a pope, he added. “There wasn’t a single incident in all of Rio de Janeiro in all of these days and all of this spontaneity,” Francis said, responding to concerns raised after his car was swarmed by an adoring mob when it took a wrong turn and got stuck in traffic. “I could be with the people, embrace them and greet them — without an armored car and instead with the security of trusting the people,” he said. He acknowledged that there is always the chance that a “crazy” person could get to him. But he said he preferred taking that risk than submitting to the “craziness” of putting an armored wall between a shepherd and his flock. Francis’ news conference was remarkable and unprecedented: Pope John Paul II used to have on-board press conferences, but he would move about the cabin, chatting with individual reporters so it was sometimes hit-or-miss to hear what he said and there were often time limits. After Benedict’s maiden foreign voyage, the Vatican insisted that reporters submit questions in advance so the theologian pope could choose the three or four he wanted to answer and prepare his answers. Francis spoke lovingly of his predecessor, Benedict XVI, saying that having him living in the Vatican “is like having a grandfather, a wise grandfather, living at home.” He said he regularly asks Benedict for advice, but dismissed suggestions that the German pontiff was exerting any influence on his papacy. In one of his most important speeches delivered in Rio, Francis described the church in feminine terms, saying it would be “sterile” without women. Asked what role he foresaw, he said the church must develop a more profound role for women in the church, though he said “the door is closed” to ordaining women to the priesthood. He was less charitable with the Vatican accountant, Monsignor Nunzio Scarano, who has been jailed on accusations he plotted to smuggle €20 million ($26 million) from Switzerland to Italy and is also accused by Italian prosecutors of using his Vatican bank account to launder money. Francis said while “there are saints” in the Vatican bureaucracy, Scarano wasn’t among them. The Vatican bank, known as the Institute for Religious Works, has been a focus of Francis’ reform efforts, and he has named a commission of inquiry to look into its activities amid accusations from Italian prosecutors that it has been used as an offshore tax haven to launder money. Take it away Joel and Liza!